Not exactly Eli Manning's best game last night with 3 interceptions and a hope crushing last minute fumble. The fumble came as he attempted to slide head first after scrambling for a fist down. Even though there was still 3:00 left in the game when it happened, the Giants weren't able to recover. The Eagles took the ball down the field and capped their drive with a field goal which brought the final score to 27-17 Eagles. Every time I see Eli mess something up all I can think of is the marketing team at Citizen slapping themselves in the forehead. 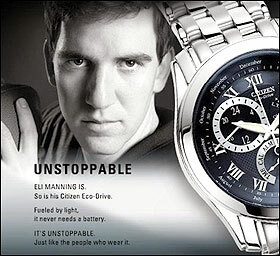 It doesn't seem like they could have chosen a worse spokesperson for a product tagged, "unstoppable." There isn't a more stoppable looking face in the NFL. Seriously, nobody in the NFL can quite pull off the, "I was just awkwardly stopped and I'm not sure how I feel but I kinda want to sulk by myself for a bit" face, like Eli Manning can. How long until we can get a .gif of the self-imposed fumble with the unstoppable tag line? Eli Manning is fueled by light. And he has to be one of the wealthiest 15 yr old boys around.